Newton Abbot sits at the head of the Teign estuary some 12 miles (25 km) south of Exeter and has been a market town since 1220 AD. The name springs from the fact it was a New Town established by the Abbots of Torre Abbey. In medieval times, the town thrived on the Devon wool and leather trades. In 1583 Humphrey Gilbert, a local adventurer, landed in Newfoundland and claimed it as a British colony. Between 1600 and 1850 there was a steady trade between Newton Abbot and the cod fisheries off the new colony. Bovey Basin just to the northwest of Newton Abbot was long known for the quarrying of Ball Clay, a product of decomposed granite washed down from Dartmoor but in the late 19th Century the clay was found close to town at Decoy, once part of the grounds of Old Forde House. The area became a quarry and the valuable clay, used to produce everything from quality ceramics to toothpaste, was excavated and taken to Newton Town Quay for transport by barge. The most rapid expansion of the town, however, occurred in the Victorian era when the South Devon Railway locomotive works were built and Newton Abbot became a railway town. The railway works have long gone but Newton Abbot remains a lively market town with some interesting historic buildings, a working malthouse and some fine parks. There is a well-known racecourse just outside of town. This National Trust property is a 13th century manor house surrounded by woodland. Its magnificent great hall displays the royal coat of Arms of Elizabeth I. A natural hollow in the woods close by is known as the "Puritan Pit" where non-conformists once held secret services to avoid persecution. 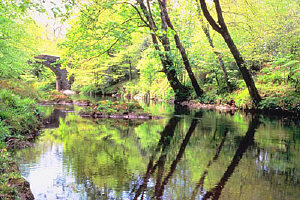 Decoy Country Park is located on the edge of Newton Abbot. It was once the local Ball Clay works but after the quarry closed in 1965 the area was naturalised and now supports a variety of wildlife in ponds, streams, fens and woodlands. There are play areas for children, a lake for water sports and a woodland trail. Hannahs at Seale-Hayne is a unique charity and visitor destination, set within 90 acres of spectacular Devon countryside, just outside Newton Abbot. Within the Edwardian quadrangle you will find the popular Bistro, an acclaimed art gallery and artist studios and a range of shops selling unique gifts. Explore beyond the quad and you will find farm animals, a free Discovery Trail, the archery field, a laser combat course, music studios, a live music venue and the Health and Wellbeing Centre, including a hydrotherapy pool. The site also boasts a range of accommodation from glamping units to fully accessible apartments. By spending money at Hannahs you are supporting their work with people with a range of disabilities. This is a major National Hunt thoroughbred venue which lies just out of town on north bank of the River Teign some 0.7 miles (1.2 km) from the railway station. In addition to the jump racing there are monthly car boot sales and regular antiques fairs. Built back in 1610, this elegant home had King Charles I to stay in 1625; then, perhaps to demonstrate its neutrality, it welcomed Cromwell and Fairfax in 1646. Finally to illustrate the changing tides of history, William of Orange stayed here in 1688 on his way to London to assume the English throne. Today the Teignbridge District Council owns the building and, if you like, you can get married there. All that now remains of the medieval church of St Leonard (circa 1350) is this ancient tower in the centre of town. A plaque marks the spot where the first declaration of the Prince of Orange (William III) was read in 1688. Claims to be the only traditional malt-house in Britain open to the public. Guided tours permit you to follow the brewing process from barley to beer. The Maltings produce malt for over 30 breweries, enough to brew 15,000,000 pints of beer each year.